New Year, new You, right? So enough talking, let’s get straight to the point – try pilates in the New Year. Injuries can leave us incapacitated for weeks and months. But what if we could use exercise as a way to prevent injuries rather than cause them? Pilates focuses on your core, strengthening your abdominals and back muscles. Think about how much you use your core every day without even realising: to stand up, walk, bend over, even to sit in a chair. If you suffer from back pain, it’s probably because these muscles are weak. Strengthen them and you’ll alleviate current woes and help prevent future pain. 2. Build core strength and long, lean muscles. For most of us, the core is the weakest part of our bodies, but it’s our center, where all our strength originates from. When it’s weak, the entire body is weak. 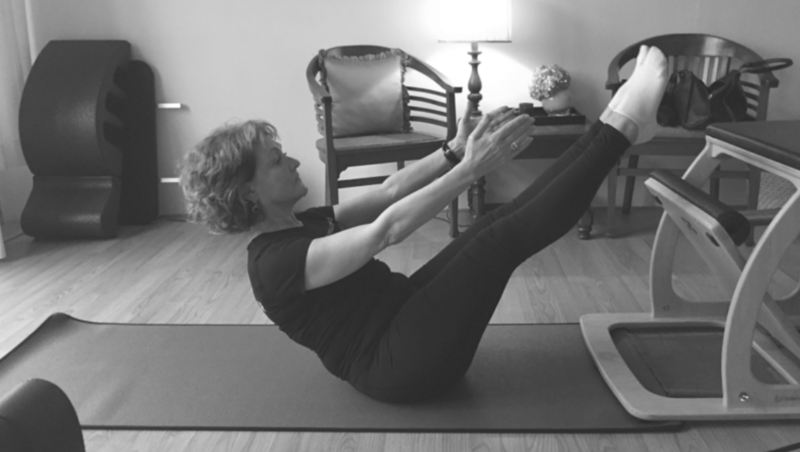 Pilates focuses on exercises that constantly engage the core, working on a deep level. Unlike weight lifting that can cause muscles to shorten and bulk, Pilates focuses on resistance and assistance training to work both sides of muscles simultaneously. This allows the muscles to elongate to get that long, lengthened, toned muscle look. 3. Increase flexibility, coordination and balance. Not surprisingly, your balance and coordination come from your core as well. When Pilates strengthens your core, those muscles that control balance and coordination are also strengthened, helping to prevent falls and injuries. Increased flexibility also allows muscles to lengthen and be more pliable so they can bend and stretch further to alleviate the possibility of injury. 4. Eliminate shallow breath and increase lung capacity. It has been scientifically proven that controlled breathing has score of health benefits: increased focus, decreased stress, enhanced relaxation, better circulation, more efficient respiration, and lower blood pressure. Pilates is unique in its use of specific breath patterns, forced active exhalation and employment of the lateral/intercostal breathing technique. With this intense focus on breath, the exercises become more fluid, precise and controlled and the Pilates practictioner’s mind becomes free of distracting thoughts. By the end of the session, one usually leaves exhilarated, less anxious and with a deeper understanding of the relationship between the body and the mind. Pilates helps you improve your posture, and the simple act of standing with good posture can make people appear 5-10 pounds thinner. And more confident, too! Pilates is not just an exercise method, it is a lifestyle. You don’t leave the class behind when you walk out the door. You try to incorporate all of the elements into your daily life—engaging your abs, standing tall, relaxing your shoulders, moving with grace. Pilates is so versatile that you can do it anywhere. All you need is your own body. Still wondering if Pilates is right for you? Joseph Pilates, the father of the method, once said, in “10 sessions you’ll feel the difference, in 20 sessions you’ll see the difference, and in 30 sessions you’ll have a whole new body.” Doesn’t that seem like something wort trying? Get in touch with Aspire Pilates to book a session here and now. Legend has it that Joseph Pilates invented the reformer when he was interned on the Isle of Man during WWI. He taught wrestling and trained his fellow prisoners that were bed-ridden using resistance of bed springs. Health conditions were bad and yet – according to Pilates legend – none of the prisoners fell sick during the infamous flu epidemic. So could taking a Pilates class improve immunity? Is this yet another reason for stepping up your regular practice to stave off winter colds and flu? In his book “Return to Life Through Contrology” Joseph Pilates emphasised blood circulation (for “bodily house cleaning”) and breath (squeezing out “every atom of old air”). When the muscles are stretched, circulation improves. This, combined with the deep breathing associated with Pilates exercise, brings more oxygen to the muscles, creating healthier cells in the body. Take 100 hundred, doesn’t this exercise make you feel re-envigorated? Furthermore, the body/mind connection, so pivotal in our Pilates practice, helps relieve stress and brings a sense of well-being. Our brains accelerate “the happy chemicals” production: endorphins and serotonin, giving us a natural high. This in turn boosts the immune system and helps to stave off flus and colds. Do not let autumn blues get to you, stay active, keep moving. 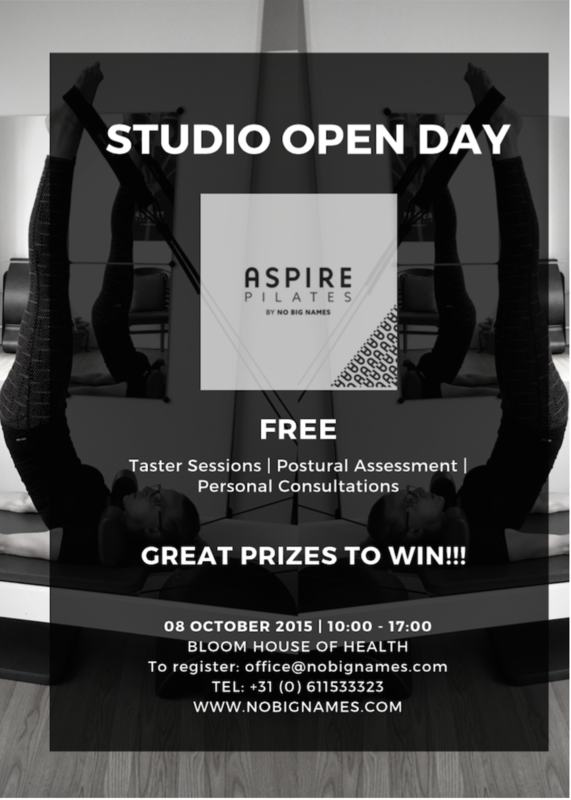 Aspire Pilates is holding an open house on Thursday, October 8, 2015. The purpose of the event is to raise awareness of the many benefits that Pilates brings to every age group and encourage healthy living. 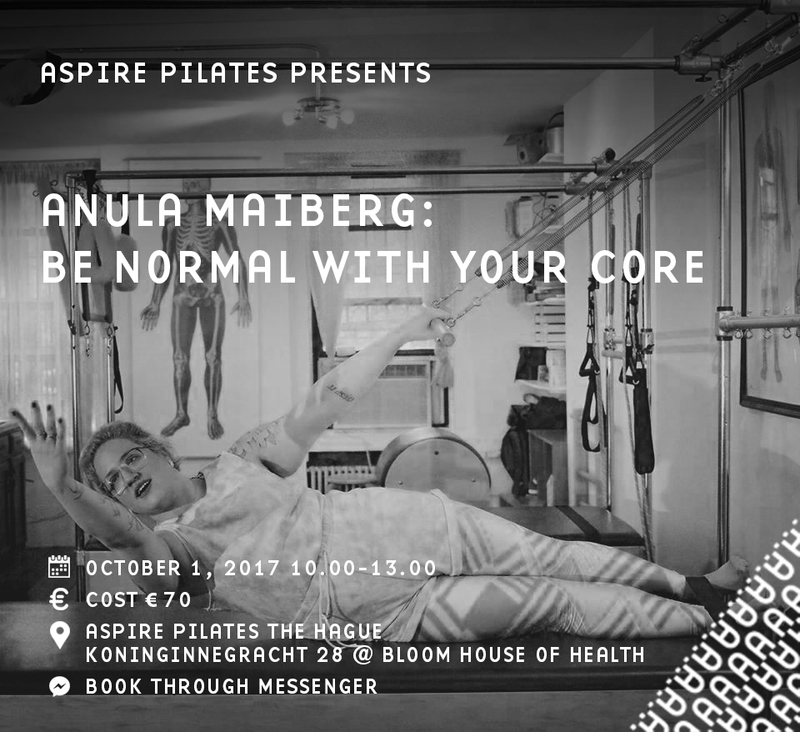 Open Day will run from 10.00 to 17.00 at Aspire Pilates Studio — at the Bloom House of Health, in the Koninginnengracht 28. The studio will offer free postural assessment, private consultations, and taster one-on-one sessions between 10.00 – 16.00. All are welcome to stop by the studio for tours, demonstrations, special offers and giveaways. Those who are keen to explore what Pilates is should book a free taster session. Fill in the contact form HERE for FREE registration. There will be special offers for newcomers to the studio; open day is a great opportunity to learn how Pilates can enhance your wellbeing and quality of life. Aspire Pilates is a fully equipped studio featuring state of the art Pilates apparatus by Balanced Body. The studio offers a wide range of services: Private and Duet sessions, group classes, remedial work, inter alia breast cancer recovery. Aspire Pilates is endorsed by Dr. Merle Kroll, MD and vascular surgeon, specialist in preventive health at The Hague International Health Centre. Whether you are in need of increased coordination, balance, strength and mobility, mental and spiritual rejuvenation, higher self-confidence, or just want to enhance your quality of life – Aspire Pilates can help create a programme to meet your needs. 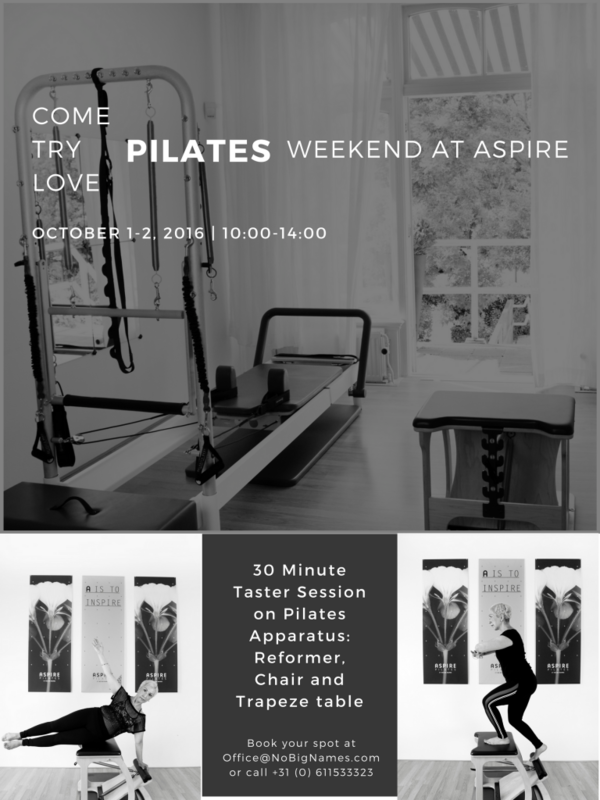 To learn more about Pilates and Aspire Pilates studio CLICK HERE! Send your friends, family, neighbours along. Lots of prizes and give aways await!